This is a wonderful ancient Roman rock crystal intaglio, dating to the 1st century B.C. 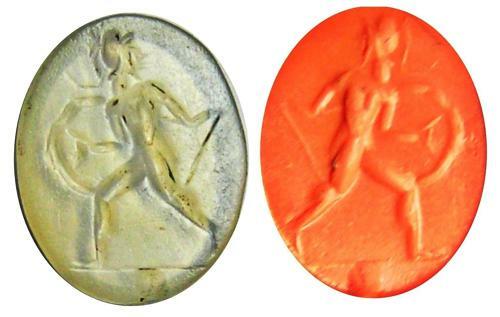 It is finely cut with a representation of Romulus. Such as gem would have been set into a gold or silver military signet ring, used to seal and authenticate letters and dispatches. Today this ancient gem has survived down to us in perfect condition, suitable for remounting into a gold signet ring today.